With it being the end of January it seems like a good time to draw to your attention that I run a playlist with all the tracks I’ve featured in the previous month on Breaking More Waves on Spotify, assuming of course that the songs have been uploaded to the streaming service. If you want to follow it, as some of you nice people have, you can find it by clicking this link here. I update the playlist at the end of every month, so if you go there now you’ll find everything from January (excluding songs featured in previews of festivals), including the track I’m posting today, which is the new single from Rosa and Jenny aka Let’s Eat Grandma. 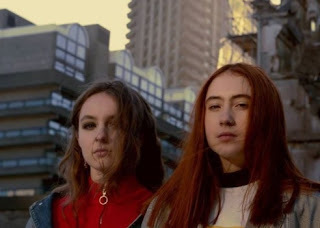 Let’s Eat Grandma served up one of the more off-kilter experimental pop records of 2016 as well as some of the more memorable mindf*ck gigs; there aren’t after all many bands that have a little lay down for a bit halfway through a song seemingly oblivious to the audience. Thankfully they didn't fall asleep as things could have become very awkward. Fast forward to the here and now and there’s a new song. It’s called Hot Pink. The band state the song is “About the misconceptions of femininity and masculinity and the power of embracing both of them. It’s about self-expression and appreciation for an underrated colour.” It’s also a bit of banger. OK, it’s not a banger in the same way as say someone like David Guetta or Calvin Harris might make a banger, but it’s a banger all the same. Just one with a dirty harsh metallic clanking chorus. SOPHIE was involved as producer and you can hear the influence.